For over 22 years, Revision Skincare has been providing physicians with the most advanced skincare products available. We are excited to now offer this line in our practice! 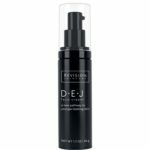 D·E·J Eye Cream™ provides intense moisturization for smoother skin texture. Advanced extracts, peptides and potent antioxidants work cohesively to create clinically-proven results. 96% of subjects experienced an improvement in the look of fine lines, firmness and overall photodamage. 90% of subjects experienced an improvement in upper eyelid appearance 96% of subjects experienced an improvement in skin elasticity. 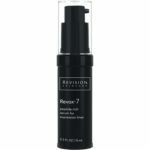 Revision Skincare Revox™ 7 is specially formulated to minimize the look of seven common expression lines, including forehead lines, crow’s feet, glabella frown lines, bunny nose lines, nasolabial laugh lines, lip lines and marionette lines. Seven cutting-edge, clinically-proven peptides work together to soften the look of lines, keep skin looking relaxed and prevent new lines from forming. Revox™ 7 works well with in-office treatments for all skin types. Nectifirm restores damaged skin and helps return it to its natural beauty. Anti-aging peptides and vitamins help reduce the appearance of existing fine lines and wrinkles while protecting and nourishing the skin. Nectifirm rejuvenates fragile skin on the neck and décolletage by catering to the neck’s specific needs. It contains 8 actives that work together to help strengthen the skin in this area. With continued use, the neck and décolletage will feel increasingly smoother, hydrated, and firmer. Protect your delicate skin from harmful UV rays. With Intellishade SPF 45 tinted moisturizer, natural mineral coverage is combined with Intellishade Technology to provide flawless cover. Powerful peptides help to reduce the appearance of existing fine lines and wrinkles. Broad spectrum sunscreens help protect the skin from harmful UVA/UVB rays, while maintaining a light, non-greasy feel. This is ideal for all skin types, including sensitive. Teamine Eye Complex is clinically proven to reduce dark circles, alleviate under-eye puffiness, and smooth fine lines and wrinkles while hydrating your skin. This light diffusing technology brightens and clarifies, while powerful anti-oxidants provide additional anti-aging benefits. The brightening, de-aging formula in Lumiquin contains a pure licorice extract shown to treat hyperpigmentations, including age spots, dark spots and melanin deposits. Powerful antioxidants hinder stress-induced signs of aging while natural moisturizers provide nourishment and vital moisture to the skin, resulting in hands that look and feel softer, smoother, and younger.